Want to diddle with your FCRs? 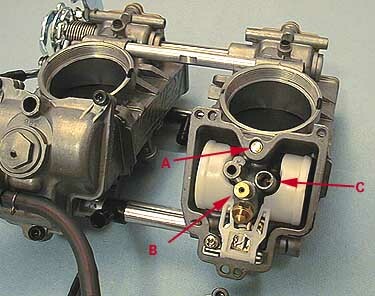 The fuel screws are located on the bottom of the carbs. Make sure to record where they were before making any changes. Count the number of turns it takes to seat the screws. These are normally counted in quarter turns. The fuel screw affects idle and near closed throttle operations. The big metal looking thing at the bottom left is the accelerator pump. As you open the throttle, a plunger pushes a diaphragm that pumps gas out a nozzle in the throat of each carb. The hose that goes between the float bowls transfers the fuel from the accelerator pump to the other carb. The left "screw" is the slow air screw. The right "screw" is the main air jet. The slow air screw is adjustable via turns, while the main air jet has a fixed diameter. Turning the slow air screw OUT makes 1/8 throttle running leaner. Note that adjustment at smaller openings have greater affect than at larger openings... 1/8 turn near 1 turn out is like 1/4 turn at 2 turns out. The slow air screw can be adjusted with a small screwdriver with the carbs installed. Simply remove the air filter and stick the screwdriver through the left opening in the airbox adaptors. The main air jet affects how lean (larger) or rich (smaller) WOT operation is at high rpm. Most folks do this to change a main jet. Close the fuel petcock and apply 14mm drive to the float bowl cover. The cover comes off and an ounce of fuel with it. I used an aerosol can lid to catch the fuel. Then apply 6mm drive to remove the main jet. Easy - this is done with the carbs installed, though fairing removal on an SS may be required. Use a 3mm allen drive to remove the 2 top screws then you have access to the needle and sync adjusters. The needle is held captive under the hex screw (I want to say 4mm drive). 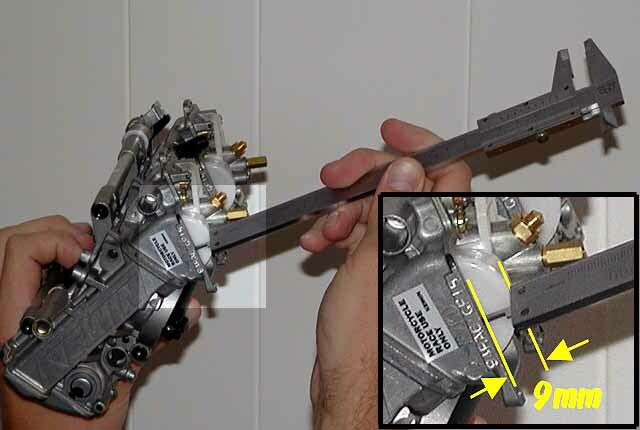 The needle's shape affects 1/4~1/2 throttle settings, while the clips affects 1/2 throttle. Carb sync is mechanical and isn't done with mercury sticks nor is it affected by valve adjustments. Turn the locknut and adjuster screw simultaneously to raise or lower the slide. The way to do this is to set the idle until a small drill bit fits perfeclty under one slide. Then adjust the other slide until it has the same setting. Note that carb sync, once set, should not change over time. This should be an unusual sight. Pulling the three screws reveals the float chamber. 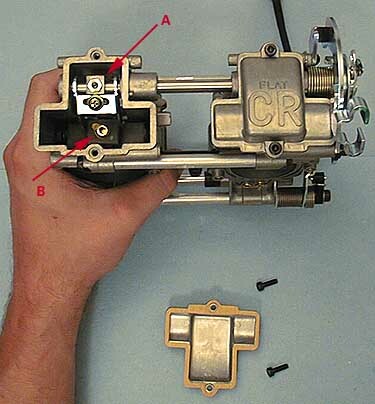 Shown are the fuel screw (A), protruding main jet (B), and recessed slow jet (C). Letters correspond to the larger image. The slow jet affects idle and closed to 1/8 throttle operation. The slow jet and float height are the only adjustments that you should remove the float bowl. Keep in mind that the fuel screw can be adjusted with the float bowl in place. 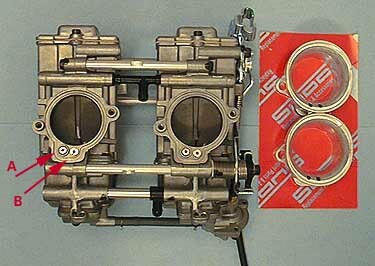 Among the more important adjustments on the carburetors is the float height. This setting / adjustment is likely the source of improper temperment of bikes that seem to be jetted "OK" but still seem off a bit. 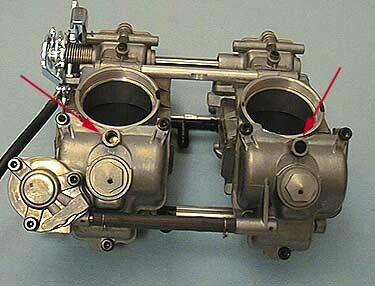 The float height is the foundation for how the carburetors operate. It is crucial that the float height is set evenly and correctly upon installation. To check this setting, I hold the carbs at such an angle that the float lightly depresses the plunger on the needle valve. Note how the plunger has some free movement then it pushes harder against a spring. With the plunger just against the stiff part of the "spring", you measure float height from the carburetor body to the top edge of the float. The height is adjusted by gently bending the metal tab up or down.